You are here:Home-Domain.com-What Is a 301 or 302 Redirect? Both forms of redirect send site users from one URL, or webpage, to another. There is a simple difference between a 301 and 302 redirect: a 301 redirect indicates that a page has permanently moved to a new location, meanwhile, a 302 redirect says that the page has moved to a new location, but that it is only temporary. 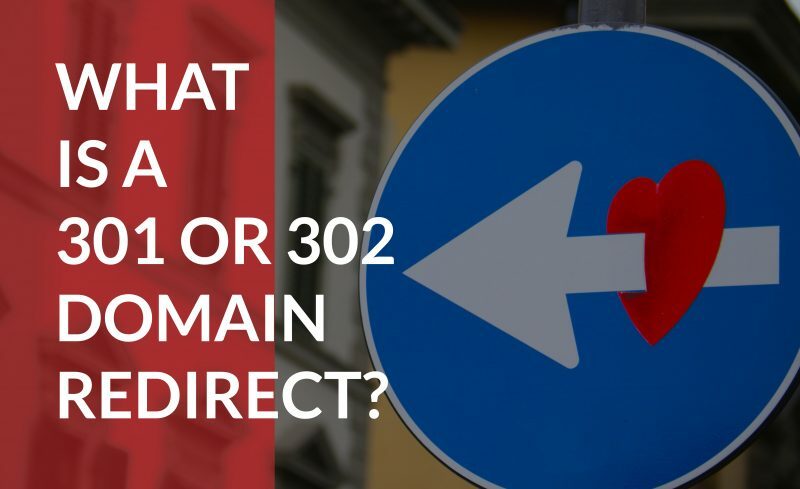 This post will cover the differences between 301 and 302 redirects further, so you’ll know which redirect is the right tool, at the right time. A 301 redirect is a status code that tells search engines and users the page has permanently moved, and makes sure that they are sent to the correct page. As this is permanent, when a 301 redirect is used it signifies that the content on the page has been moved forever. Users are redirected to a new page, which has replaced the old one. The redirect typically helps change the URL of the page when it shows up in search engine results. If you’ve invested in building a website, or starting an online store, pay close attention to the impact this has on your site. You can think of a 301 redirect like a Change of Address form that you would have to fill out with the Postal Service if you were to move. Just like your mail being rerouted from your old address to your new address, your web traffic is sent from your old URL to the new URL. Thankfully, you won’t lose all of your hard work building up your old site in search engine result pages (SERPs). All of your existing SEO value and link equity for the old URL is transferred to your new URL. Whereas a 301 redirect is a permanent relocation of your URL, a 302 redirect is a temporary change that redirects both users and search engines to the desired new location for a limited amount of time, until the redirect is removed. This 302 redirect may be shown as a 302 found (HTTP 1.1), or moved temporarily (HTTP 1.0). Using a 302 redirect when you should have used a 301 redirect becomes an issue when search engines try to determine which page is of higher value. It is likely that the search engine will only list one version of the page in its search engine results, meaning the wrong page could wind up being the one that gets listed. This problem will compound over time as a chain of redirects builds upon older sites. What do the 301 and 302 numbers signify? The numbers of these redirects refer to their HTTP status code. There are five classes of HTTP status codes within the official registry, and the first digit of each status code identifies its response class. When a code begins with the number three, it signifies that the code belongs to the redirect class. Why does the status code matter? The code is important because of your “link juice.” This charming term refers to search engine equity that you have built up for a specific URL. When you need to let search engine crawlers know that your site or page has moved, you must properly redirect them to the new page. The “status” of your redirect is therefore significant, or else you will risk losing this “link juice” and essentially start from scratch. You also may potentially compete against your old page at the same time. When your URL is properly redirected, you maintain your link juice and domain authority as you shift everything over to your new page, meaning you maintain your search engine rankings and link power. A 302 redirect does not pass the “juice,” or keep your domain authority to its new location. It simply redirects the user to the new location for you so they don’t view a broken link, a 404 not found page, or an error page. This helps with your user experience, but it is rare that a 302 is a better option over a 301 redirect. Let’s take a look at when you should use each. When should you use a 301 redirect? When a webmaster mistakenly uses a 302 redirect when they should have used a 301 redirect, it can cause issues for the website. Since search engines react to each redirect differently, you need to make sure you’ve set up the right one. Otherwise, the search engine may determine that one is a mistake, and stop sending traffic to the wrong page. By knowing the differences between 301 and 302 redirects, you can stop this from happening, and help to optimize your website’s search engine optimization performance, as well as making sure you don’t lose any of the SEO you built up on your previous page. There are several instances when it is a better option to use a 301 redirect, which is a permanent redirect. When links to any outdated URLs need to be sent to a new page. For example: if you are merging two websites. You use several different URLs to access your site. You should select a single URL to be your preferred destination and use your 301 redirects to send traffic to your new website. You’ve permanently changed your website domain name and want to transition away from your old site as seamlessly as possible. You’re converting your site from an http to an https. When a 301 redirect is set up, your new page shows up in search engine results with a 301 redirect. The 301 code tells search engines that you have moved your site permanently and all traffic should be redirected from your old content to the new. The search engines can then direct search engine ranking and value signals toward the new URL because it will understand this location to be your new, permanent home. Despite this being the better choice in the majority of scenarios, there are certain times where it would be a better option to use a 302 redirect. When should you use a 302 redirect? Despite the fact that a 302 redirect does not distribute SEO, there are a few scenarios where it actually makes more sense to use one. This is a less common scenario, simply because you wouldn’t often temporarily move a webpage, but there are situations where it is appropriate. An example of such a time would be in an e-commerce setting. For instance, if you have a product that is no longer available for sale, such as aseasonal or out of stock item, you can create a 302 redirect and send users to the category page of your web store. Since they can’t order the product at that time, it makes sense to show them similar products that are currently available. The 302 tells search engines that the website is just offline temporarily, and the value of the page should remain intact rather than passed on to another URL. Another reason webmasters may use a 302 redirect over a 301 is to avoid the Google aging delay (more on this in a minute) that is associated with a 301 redirect. However, this can become an issue for Google, because it eventually has to consider whether or not the webmaster actually meant to use a 301 redirect. Google tries to make these decisions, because it wants to improve the search engine experience. Google also knows that webmasters have often used a 302 redirect when a 301 redirect was the more appropriate choice. This strategy can cause issues in not only the search engine ranking but also the continued indexing of the old URL and link popularity being split up between the old and new URLs. Another scenario for a 302 redirect would be appropriate if you are conducting A/B testing for a web page to test its functionality or design. This is actually a good practice to soft launch your website to see which version is more desirable or provides a better user experience. By using a 302 redirect, you can get client and user feedback on your new page without impacting your site ranking. When you move a web page or entire website to a new location, you want users to still be able to find your site. You then want to use a redirect to tell the user’s web browser to automatically forward them from the old location, to the new one. And while you would hope that this would be an instant process, and that Google or other search engines would follow the redirects right away, this sometimes isn’t the case. Moving a website can sometimes trigger what is known as a Google aging delay. If this occurs, the site will drop out of the search rankings for several months, even up to a year, which can be rather catastrophic for certain companies. Thankfully, Google won’t penalize a webmaster for mistakenly using a 302 redirect when they meant to use a 301. Google checks, and if it determines that the user meant to use a 301, they treat the redirect as such. However, it is much easier for you to make the right designation on the front end, rather than guess and hope Google fixes it. There is also no guarantee that Google will make the correct designation, so hopefully, by reading through this post, you’ll be able to set up your redirect to the correct setting, usually a 301. Just remember. Permanent redirect = 301, while temporary = 302.